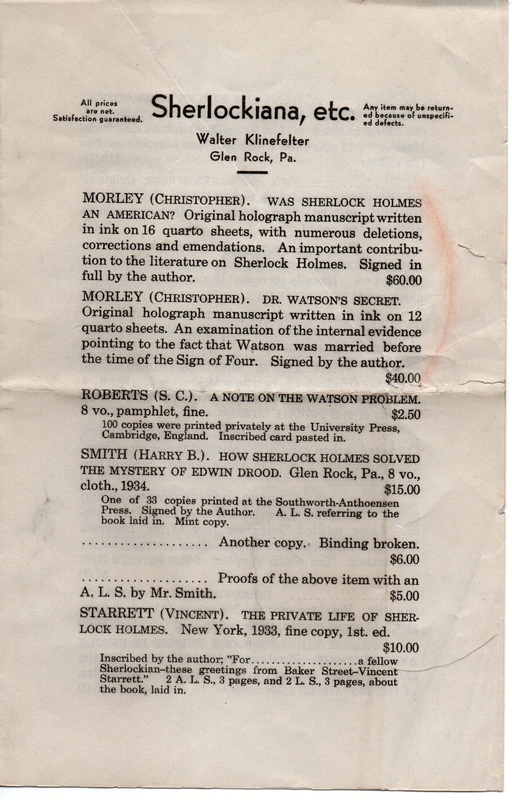 A pamphlet from the 1960s provides tantalizing clues about the manuscript for Vincent Starrett's most famous book, The Private Life of Sherlock Holmes. I have this recurring dream. Nightmare, really. I am in a used bookshop. Shelf after shelf of beautiful, pristine volumes are lovingly displayed, and the prices are surprisingly reasonable. I go up to the clerk (who sometimes looks like Courteney Cox—this is assuredly NOT the nightmare part) and ask if she has any books by Vincent Starrett. Courteney’s normally pixie-ish face takes on a sad and slightly embarrassed look. “I had a huge amount of Starrett’s stuff for years, right here,” she says pointing over her delicate shoulder to an empty shelf. Walter Klinefelter's most popular contribution to Sherlockian literature was his Sherlock Holmes in Portrait and Profile, first published in 1963. Surprisingly, the transformation is also NOT the nightmare part. That’s the nightmare part: knowing there are Vincent Starrett treasures out there somewhere, and knowing I’ll likely never have access to them. The nightmare has its true life analogs. Like anyone who gathers up books, I’ve had similar experiences in real life bookshops (never with Courteney Cox, sadly) and have learned to come to grips with being too late. As I said, Klinefelter and Starrett corresponded for decades, and when Starrett hit one of his frequent economic declines, Klinefelter helped by quietly purchasing some unique items of Starrettiana. I’ve thumbed through many book catalogues over the years, but these four pages provide more envy-worthy words per page than anything I’ve ever seen before. A fine first edition, first printing copy of The Private Life of Sherlock Holmes, inscribed to “a fellow Sherlockian,” with multiple letters about the book included. Page 2 of the Klinefelter catalogue. Turn to the second page. The first time I looked at the second page, I felt a little dizzy. Here's why: While editing the 75th anniversary edition of The Private Life of Sherlock Holmes I had often wondered where the manuscript pages were. In some dusty file once maintained by Macmillan? Long lost to careless record keeping? Or in some forgotten library archive? The envy grows worse glancing down the page. Look at the entry for the title essay, the third entry from the top. “Heavily corrected throughout.” What? What did he correct? What was in the original? And why the changes? More importantly, did they impact the last paragraph of this chapter, the paragraph that presaged Starrett’s immortal sonnet, “221-B”? But there can be no grave for Sherlock Holmes or Watson … Shall they not always live on Baker Street? Are they not there this instant, as one writes? … Outside, the hansoms rattle through the rain, and Moriarty plans his latest devilry. Within, the sea-coal flames upon the hearth, and Holmes and Watson take their well-won ease … So they still live for all that love them well: in a romantic chamber of the heart: in a nostalgic country of the mind: where it is always 1895. Page 3 of Klinefelter's catalogue. Next, take a glance up to the third page, where “on the verso of the last sheet Starrett has jotted down a tentative list of contents of The Private Life.” One’s pulse quickens at the thought. Is this the same list that Starrett sent to Gray Chancler Briggs on 17 March, 1933? (See page 13 of Dear Starrett—Dear Briggs—, published in New York by Fordham University Press in 1998.) Do the two lists differ in a way that would show how Starrett’s thoughts progressed while the book was in production? And then, to add insult to it all, look at the prices. Pittances for such prizes! Trifles for such treasures! Yes, I know that if the catalogue was produced in the 40s or 50s, these pre-inflationary prices would have been, as my grandmother used to say when faced with an expensive object she wanted, "dear— too dear for something like that." The last page of the catalogue. Note the inscription from Klinefelter to Jerry Margolin. I had to get a drink. It is really all too much. To know that these wonderful items were for sale and must, MUST be out there somewhere is too much. Perhaps tonight, when I dream of the treasures to be found in used bookshops, I won’t be too late this time.